A Kenyan judge Thursday sentenced one of the country’s most famous white aristocrats to eight months in prison for fatally shooting a suspected poacher on his family estate. The case of Thomas Cholmondeley, 40, has highlighted the country’s fractious relationship with its British colonial past. Cholmondeley is white and his victim was black. 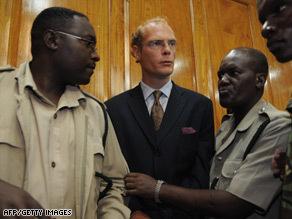 Justice Muga Apondi said he did not take race, color, wealth or status into account in deciding the sentence for Cholmondeley, who was convicted of manslaughter. “There should be no suggestion that there is one law for the rich and one law for the poor,” Apondi said. In deciding what he described as a “light sentence,” Apondi noted the 1,097 days that Cholmondeley has already served behind bars. “I do believe deeply that the process has humbled the accused person,” the judge said. “This court has taken into consideration that the accused has been held in custody for slightly over three years since he was arrested.” Cholmondeley was charged with shooting Robert Njoya, a stonemason. Njoya was on Cholmondeley’s expansive Rift valley ranch and wildlife sanctuary with two others and a pack of dogs. Cholmondeley, suspecting Njoya of poaching, fired his rifle and killed him. “I find that there is no evidence that the accused acted with malice aforethought,” Apondi said Tuesday. He added that the defendant tried to render first aid to Njoya after the shooting. Cholmondeley spent three years in a maximum-security prison while the case was beset by delays and controversy. Fueling public anger was another incident, in which Cholmondeley was accused of shooting a game ranger who was out of uniform. That case was dropped because of a lack of evidence. Cholmondeley comes from a prominent British family that includes the third Baron Delamare, who came to Kenya at the turn of the 20th century and became one of the country’s most prominent white settlers. The Eton-educated Cholmondeley has transformed his Soysambu Ranch into a wildlife sanctuary and tourist attraction. He also has started a number of notable businesses in the region. Most of Kenya’s white settlers left after the country’s independence in 1963. Many of those who stayed took Kenyan citizenship. Though they represent a tiny fraction of the landowners in Kenya, some Kenyans resent their ownership of property.